In a small villa on the outskirts of Siena, Achille Sclavo founds the Institute, to produce the serum against anthrax he had discovered. The Sclavo Institute is restructured to meet the scientific advances of the time and the needs of World War I. After the death of the founder, the Institute remained a family business, gradually establishing itself at the national level. The increasing degree of technical sophistication leads the Institute to be a modern center not only of production, but also for the study and research. The Institute begins to produce Sabin’s anti-polio and starts the collaboration with the Wellcome Foundation in London. The Institute extends in the US, while the futuristic Research Center is born and the activities of the new area of Rosia start. From the collaboration with Venter, the Reverse Vaccinology technique is born, key of the vaccine against meningococcus B. The company becomes one of the most important realities in vaccines, whose study proceeds, in addition to their use in mass vaccinations. With the integration in GSK, the Siena and Rosia site becomes part of a pharmaceutical company committed on a global scale. The increasing degree of technical sophistication required by the equipment for the production of serums and vaccines led the Institute to become a modern center not only of production, but also of study and research. In addition, the export of Sclavo products had come to cover, in the 1950s, some forty Countries all over the world. In addition to the organic or chemical-pharmaceutical products, anatoxins, anatubercolines, serums and vaccines, the Sclavo Institute developed the sero-diagnostics of syphilis and, in general, diagnostics, a new scope of application that included subjects ranging from serology to clinical chemistry. In 1950 the Sclavo Institute participated in the founding of UNISERUM, the Center of Immunology and fight against infectious diseases, born from the collaboration with the Mèrieux Institute of Lyon, the Llorente of Madrid and the Swiss Serotherapeutic of Bern. It also started a collaboration with the World Health Organization for the supply of smallpox and cholera vaccine, aimed at containing the serious epidemic situations in Central Africa and the Far East. In 1952, the US Federal Security Agency granted the license for the production and circulation throughout the US of Sclavo biologic products, deemed compliant with the requirements of the strict American legislation, with the consequence of being able to obtain from the Food and Drug Administration the chance to apply for the specific registration of the main serums and vaccines. In collaboration with the National and International Virology Centers (WHO), starting in 1955 the production of flu vaccine was scheduled in Siena, and in 1958 was licensed. 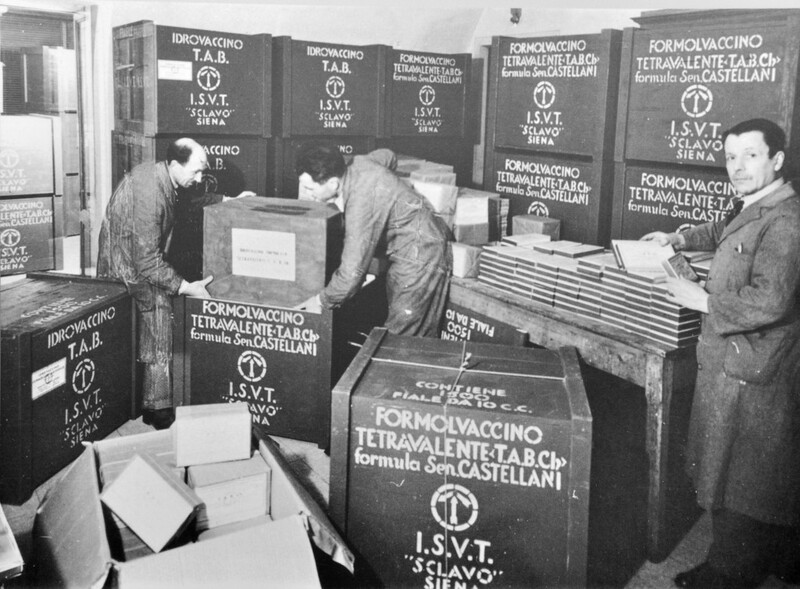 In 1954 Albert Sabin visited the laboratories of Siena and decided to send – gratis – to the Sclavo Institute 50 ml of each of his three original strains of SO+1 polio.